The right place to learn languages! For over 40 years Fairfield College has been in the limelight in Hilversum and its surroundings concerning tailor-made language courses. This means a lot of experience, but we haven’t remained trapped in time. On the contrary! In the 1970s, we specialised mostly in conversational classes and courses of trade correspondence in a foreign language, but nowadays our students learn to give their company presentation in flawless English or fluent French, or to master the e-mail or mobile phone conventions as they are in Germany, Spain or Italy. Over the years, NT2 education has also received a much larger share in our course offerings; Dozens of new Dutch have now obtained their integration diploma under the guidance of our teachers. However, the personal approach and the custom made courses have remained unchanged over the years. After all, every student is unique. Whether you are looking for a group course as an absolute beginner or an advanced language course, you have come to the right place. We provide tailor-made individual courses, open training courses and in-company courses. Carla Detti is the director of Fairfield College. 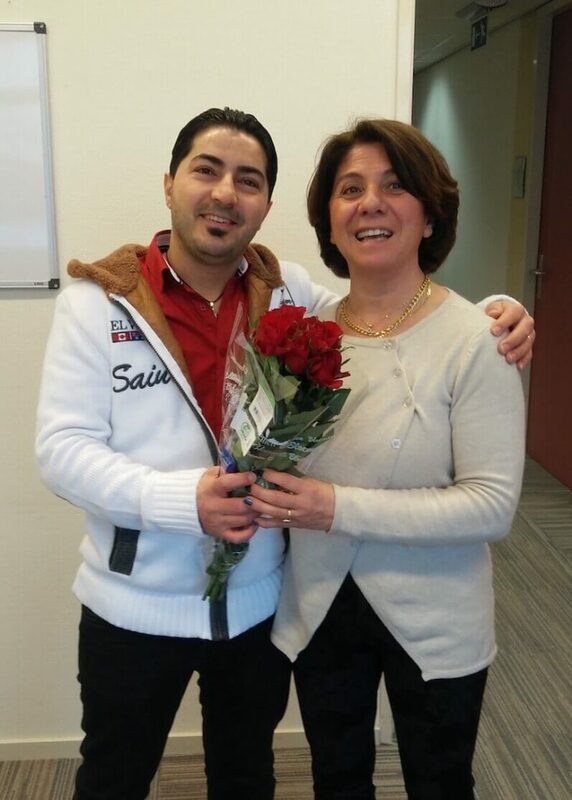 On the photo you can see her standing next to a student who just passed his integration exam. In Italy she studied German and Spanish, and in 1989 she started working as a language teacher for Fairfield College. In 2000 she became the director of the school. Fairfield College’s main focus has always been on language education. Because of the large influx of immigrants starting around 2008 and Fairfield College’s vast experience in language education, it was a logical step to start helping these people find their place in Dutch society. Therefore, since 2008, in addition to language courses, Fairfield College has been providing integration courses. Carla’s most important values are to create a warm and welcoming atmosphere inside the school and to support both teachers and students. Problems can always be openly discussed and there is plenty of room for solutions and changes. In addition, Fairfield College strives for high results: 99% of the students pass the integration examination, the students give the school a 9.4 for customer satisfaction and Fairfield College has often taught groups of employees from large international companies, television stations and media companies. Fairfield College has also often been asked to share their opinion on news items concerning civic integration. Following a comprehensive audit by the CPION, which we have met gloriously, Fairfield College was included in the Central Register of Vocational Education (CRKBO) in January 2011. Inclusion in this registry confirms that our institution meets the stipulated quality requirements and is thus exempted from VAT regulations. For students and clients of Fairfield College, this registration has pleasant benefits: independently tested quality and an invoice without 21% VAT. We use the Common European Framework of Reference for Languages (CEFR) to determine language levels. Just arrived in the Netherlands? Do you come from outside of the European Union and do you wish to stay in the Netherlands for a long period? Do you wish to move abroad for business or holidays, or do you want to improve your current language skill level?